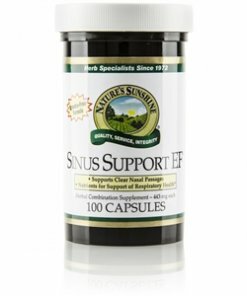 Nature’s Sunshine Sinus Support® EF blends burdock root, synephrine (immature orange peel), capsicum fruit, golden seal root, parsley herb, horehound herb, althea root and yerba santa herb to clear the sinus systems. The herbs included in the formula nourish the respiratory system to keep it functioning properly. Sinus Support EF is a natural source of trace amounts of magnesium, potassium, silicon, zinc, vitamin A, vitamin C, and thiamine.